Now it's easier than ever to enhance any dessert or dessert drink with the taste of sweet, luscious white chocolate - simply add this ready-to-use DaVinci Gourmet white chocolate flavoring sauce! Featuring a blend of lightly toasted vanilla beans, cream, and sugar, this white chocolate flavoring sauce enhances the aroma and taste of any drink or dish. Slightly sweeter than milk chocolate, white chocolate is a versatile flavor that can be used in hot drinks like mochas, blended drinks like frappes, and even ice cream sundaes! Mix it with chocolate or vanilla ice cream for indulgent milkshakes, or try drizzling it atop cupcakes and other baked treats for a decadent glaze. 64 ounce bottle with a hand grip on the side for picking up or pooring if you don't have a pump. The sauce is thick and consistant with sweet and savery white chocolate taste. This is by FAR our most popular flavor! Our customers love the white chocolate. In fact, I had to stop in the middle of writing this review to make 3. White chocolate is good, but this brand is out of this world. We make Ice white chocolates topped with DaVinci's caramel sauce, It is delicious, our customers love it. I use this in my coffee shop and I don't think the flavoring I quite right. I've never gotten a complaint about it but when I make drinks with only white chocolate and no other syrups the flavor is a little off. I don't think this is for me and I found a cheaper product to use but that's just what I think. I have noticed many people saying our White Mocha coffee isn't as good as other places because the flavor isn't noticeable. We have to use more of this product for customers to like It. Will be looking into other brands. This is my favorite sauce to add to my coffee. Tastes just like the White Chocolate Mochas from a coffee shop, but saves a ton of money when I can make them at home! If you like White Chocolate Mochas, this will not disappoint. I wish that they sold this sauce by the case because we go through so much of it here. This is easily one of the best sauces that DaVinci makes. You have got to try it. 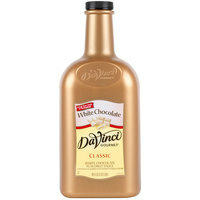 The DaVinici gourmet white chocolate flavoring sauce is perfect for our desserts. It is really delicious and is great for decorating our cakes and pies. This product is so smooth and rich, i like the flavour and the added thickness it added to my product, my customer love this new richness, i will definately order more. A really rich white chocolate sauce that is perfect for making white chocolate cocoa. The sauce is very flavorful and a great price. A supreme quality sauce. We use this white chocolate flavoring sauce for making White Hot Chocolate or the occasional white mochas. It has a delicious, not too sugary flavor. For some odd reason, DaVinci is not as well-known as some of the other brands that make dessert sauces and I could never figure out why. It is probably the best white chocolate sauce on the market. Customers and employees prefer this in a blind taste test over the two more expensive brands. The bonus is the low price on the Da Vinci! This is our good to white chocolate. It has the perfect consistency and our white mochas are a customer favorite with this sauce, add some peppermint for a great winter drink. I have always used DaVinci and it can't be beat in a hot cup of brewed coffee, and a little Baileys.A little taste of heaven. My family loves making Holiday inspired drinks on Christmas Eve. We love this white chocolate flavoring sauce and it makes a really good white Russian variation. The DaVinci sauce is very tasty and adds a great spin on this classic cocktail. The white chocolate sauce is also great on our gingerbread cheesecake. This is delicious. White hot chocolate or White Mocha Latte are wonderful with this sauce. It dilutes appropriately and leaves a great residual taste after it's been served. This is a good product for the price, and makes perfectly good drinks. However, there are definitely better tasting white chocolate products available. Good for the price. The white chocolate sauce is very useful in things like our white chocolate mocha or anything that needs a bit more flavor. We love it in the shop. Our favorite white chocolate sauce for the price. Dispenses easily with the one ounce pump and makes a much richer flavor than any syrup has! We use DaVinci white chocolate sauce in our white mochas and our customers LOVE it! It's less expensive than other brands and we're still stealing customers from other local shops. In fact, the White mocha is our best seller. We've sold over 5,000 last year! Incredible product. So good and just what I need to add a white chocolate flavor to my white chocolate buttercream frosting. It is delicious and easy to use ! Eh, not my total favorite. The white chocolate taste is a little off in my opinion - I've had better tasting ones out there but not bad overall. Delicious, creamy white chocolate that mixes easily in my assorted coffee drinks at my restaurant. Easy to pour out of container and name brand is one I can trust for a high quality product. We use devincis white chocolate sauce in our coffee shop its become a great product will only get it from devinci has the best taste and we use it in many drinks. DaVinci's white chocolate flavoring sauce is delicious and good quality. Our cafe uses it in their specialty drinks and our bakery uses it in select pastries. Great buy! We absolutely love this product white chocolate saice from da Vinci gourmet. 64oz we use it in almost every drink. Our customers love this product as much as we do. We use the DaVinci White Chocolate Sauce in our lattes, cappuccinos, frappes, iced lattes etc. it is one of our best sellers. Our customers also love it in Milkshakes! White chocolate is one of our number one sellers of lattes! It is a must have in a coffee shop! The sauce is thick rich and sweet! One of our customers favorite flavors at a great price! I really enjoy the size and shape of the bottle, as it allows us to fit our syrups closer on the shelf! Trying this out for the first time and it made our drinks taste so delicious! We just pour it into a squeeze bottle for service. The product arrived very quickly and was packaged so securely so there were no breakages or leakages. This is just as delicious as some of the other more common brands and has a nice thin viscosity. We use it as a sauce for pancakes and other desserts. Davinci's white chocolate flavoring sauce has to be one of the best in taste..especially for desserts and lattes. Thank you webstaurantstore for the ultimate in products and service! You will not be disappointed. DaVinci makes an excellent white chocolate sauce. Use it to make a white chocolate latte or add it to a strawberry smoothie for a new twist on an old classic. This was our first taste of the Davinci line up of Flavoring sauces! We use it in several of our drinks now. Like our White Chocolate Lattes and in one of our newest candy bar lattes the ZERO bar! i love the Davinci product line. The white chocolate is great! Being able to purchase this product in 1/2 gallon size is very nice i am able to refill my own container and still have more. Delicious my nieces favorite!